Why Isn't America Watching NBC's Kings? The thing about working in Hollywood is that at some point you really get tired of hearing how godless you are, and how if you and the rest of the heathens in Tinseltown would put more God-centric shows on TV, people wouldn't be abandoning prime time in favor of their Bible study classes. If that's true, then why isn't NBC's Kings the biggest show in the history of humanity? If you haven't been watching Kings — and you haven't 'cause it's been averaging less than 4 million viewers a week — it's this alt-world royalty/palace intrigue allegory set in the mythical near-future Kingdom of Gilboa. 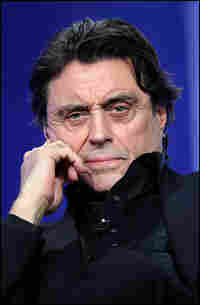 Kings stars the great Ian McShane who would be worth the price of admission even if you actually had to pay to see him. But forget for a sec the great acting, the wonderfully rendered CGIed New York capital of Shiloh, the intrigue... Here's the disconnect I can't connect with: Kings is "a contemporary re-telling of the timeless tale of David and Goliath," according to the official NBC press release and the $10 million pilot episode that revolves around a character named David who single-handedly takes out an enemy tank called a Goliath. Yes, a Goliath. The other thing about Kings is that it ain't subtle, so you gotta roll with it. And the show was developed by a major insurance company that wanted to put some dollars into a program that dealt with moral responsibility. So beyond the Biblical allegories, the plot lines of the show tend to deal with the basic notion of doing the right thing. And yet, yet the "why-don't-you-program-for-us" American public doesn't seem to care. I will freely admit that I tuned into the premiere of Kings because the marketing made it look so goofy it was like being invited to watch a train wreck happen. Only it wasn't a wreck. It was like an old-school streamliner speeding gloriously down the tracks. And like a streamliner, unfortunately Kings' days are probably numbered. It's already been moved from its original place-of-dying spot on Sunday nights to its new Saturday night graveyard. Catch it there while it lasts, or better yet go check it out at your convenience at Hulu.com. John Ridley is no longer blogging for NPR. More of Ridley's work is available at That Minority Thing.